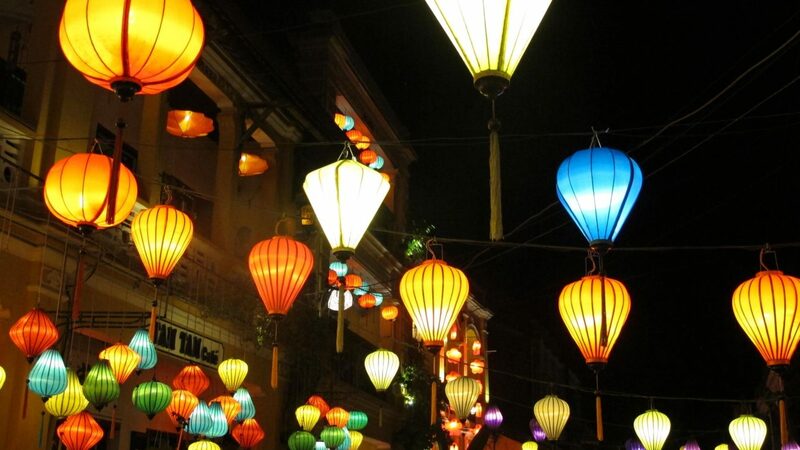 Oozing with quaintness, Hoi An is a small city in central Vietnam famous for its picturesque colonial architecture, atmospheric lanterns and abundance of tailoring shops. Its old town is a UNESCO World Heritage site — and therefore sees flocks and flocks of tourists daily — but despite being almost overrun by tourism, Hoi An unmistakably retains its charms. To paint a picture of life on sabbatical in Hoi An, here we describe a perfect day in An Bang Beach, getting bespoke clothing made, our favourite restaurants (with hyperlink to save to your maps), activities for kids and more Hoi An highlights. We came to Vietnam for its food. Everyone who had travelled to Vietnam had told us to go to Thailand instead, but I just had a feeling about it. I wanted to tire of Vietnamese food. I wanted to see this country that was the subject of so many war films I loved, get a sense of the fighting spirit of Vietnamese people, and eat. Vietnam is not as obviously friendly and welcoming as its southeast Asian neighbours. While Thailand’s tourism market has a 50% return rate, Vietnam’s is 6%. But once you get comfortable with relentless upcharging (and subsequent bargaining) and accept that people are looking out for their own interest first, the authenticity of Vietnam is well worth the extra hassle. After a month of constant movement in the P hilippines we parked ourselves in Hoi An for our second month on sabbatical. 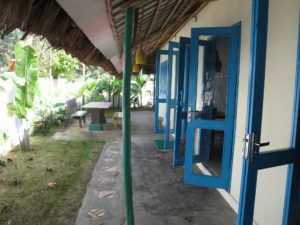 We spent the first week at a hotel in Hoi An and then moved into a beach house in An Bang Beach, 5 km down the road from Hoi An (or about a 5-minute, $4 taxi). 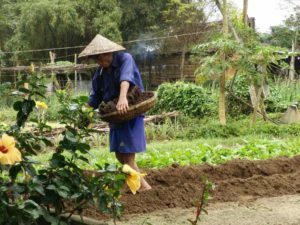 What made our time in Hoi An so special were the people we met. Hoi An attracts a certain kind of person who chooses the lesser known good life over hot and fast-paced Saigon or cold eliteness of Hanoi. We also came to Hoi An in the cooler winter season, when the temperatures ranged from 14-28 degrees — a much needed break from the tropical 30-35 degrees we’ve experienced the rest of our sabbatical. Waking up to soft sunshine pouring in from the glass doors of your beach house. Your husband is gone — he must be surfing across the street at the beach. The kids are still asleep. You make a coffee and sip it under the high vaulted ceilings of your minimally but tastefully decorated living room. Your husband comes home and tells you how beautiful the waves are and how empty the beach is. As he showers you walk down the sandy path to the sandwich stand and buy egg sandwiches on freshly baked baguettes. Your kids wake up and you enjoy your sandwiches at your picnic table outside, then play in the garden. It’s the third day of Tet — Vietnamese New Year — and your host is coming to deliver the sticky rice you made together at her house a few days ago. Her husband had recommended to fry the sticky rice and then add a tiny bit of soya sauce. He’s right — it’s delicious. Other Vietnamese and expat friends stop by and you enjoy a beer and some snacks together. The relaxed atmosphere at the beach, the open airiness of the house and the intimacy of the Tet holiday gives everyone a feeling of ease and effortlessness. In the evening you cycle over to Soul Kitchen — the only restaurant open during the holiday — where all the expats and their families have gathered at the best beachside restaurant in town. 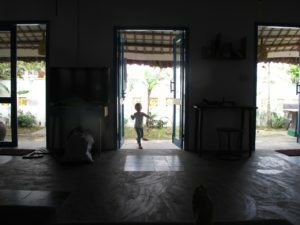 The sunset and the music dance in the air as the children group and go lounge table to lounge table seeking entertainment from their families. The live band begins — a French cover band that brings their unique playful light sound to each song. As the sun sets the candles and lanterns take over and light up the beach. Not every day was this perfect (or this devoid of Karaoke), but every day was some kind of magic. It is so much fun to have clothing custom made to your design and your body. I already had a clear idea of what I wanted before we arrived, and this really helped make the process more meaningful. I had been looking for a long trench coat — long enough to cover my legs when cycling in Amsterdam rain — and had failed to find anything that met my criteria of long -and- stylish. Here was my chance to experiment with the length without compromising on the shape and details I wanted. From talking to expats and internet research I did ahead of time, I realised there are hundreds of options. Choosing a tailoring shop mostly comes down to personality — people liked the experience best when they felt a personal bond with their tailor. We chose Ken Tailor Shop. 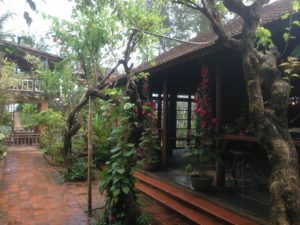 Ken was highly recommended by an expat on all the expat forums, and when I went to check him out it turned out we had a curious connection — he knew a friend of ours who Reinier was having a working lunch with, and also wanted to help the disabled artists they were working with. After settling on all the meticulous details, it took two fittings to get my coat just right. And now I have exactly what I’ve been looking for and wonderful souvenir. Details about how to buy bespoke clothing and leather bags in Hoi An coming soon. 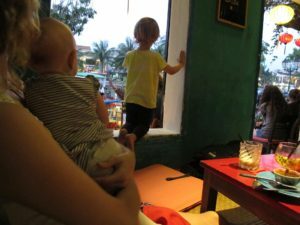 Our baby and toddler had a great time in Hoi An and An Bang Beach in Vietnam, and we met lots of families with children of all ages in town. Most hotels have bicycles to rent with child’s seats on the back, and you can easily buy a helmet and face mask for your little ones if you plan on taking a scooter. Though few restaurants have baby seats, virtually all restaurants have staff who will hold your baby while you eat! 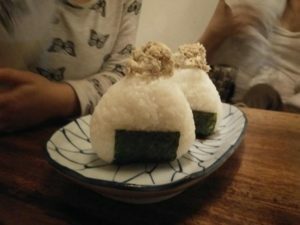 We were always most comfortable in restaurants with either tatami mat seating (so the kids could roll around safely) or wide lounge seating (kids can play and crawl around behind you while you eat). We were also often given courtesy fruit for our children to eat. The best place for kids to enjoy is the beach — An Bang Beach, or any of the other beaches along the coast. The waves are a bit too high for swimming December-March, but the rest of the year the water is calm and safe. And the sand is always fun. There are also lots of restaurants and cafes to keep you comfortable while your kids play in the sand. 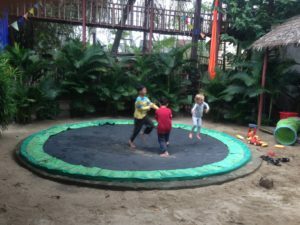 There are a few playgrounds in Hoi An, but by far the best playground in town is Dingo Deli – kid-friendly restaurant with outdoor playground and indoor play room. There’s always someone here to play with! Tra Que Village is another great place for older children to learn about where food comes from and gardening. Every travel blog and website about Hoi An will tell you that the best thing to do is to walk around the old town in the evening. Photogenic lanterns light up the streets and local characters emerge with all sorts of glowing gadgets to sell you. 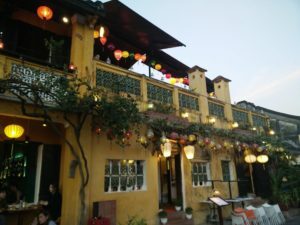 Cross the bridge and check out the night market, or take a break and enjoy happy hour at one of the many restaurants, cafes, and rooftop gardens. It’s also possible to explore Hoi An by water. Hire one of the small gondola-style boats along the water and be quietly pushed through town in the tranquillity of the river. Or take a motorboat and go for a tour during the day. Our first day in Hoi An was the full moon. Throughout the day we saw shopkeepers performing short rituals on the sidewalks in front of their shops. They would place a basket of fruit and other small foods along the edge of the street, light an incense stick, pray and then place the incense in the basket. Some of them would burn paper as part of the ritual. We learned that this was part of their Buddhist tradition every full moon. 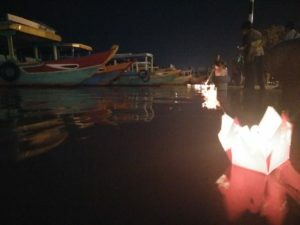 When night fell we walked to the waterfront and an old lady offered (aggressively insisted) our daughter a paper lantern with a candle inside to float down the river. As we walked closer to the heart of the town these floating lanterns multiplied and multiplied until there were hundreds gracefully parading down the riverfront for all the expensive cameras to photograph. The best view was from the bridge. 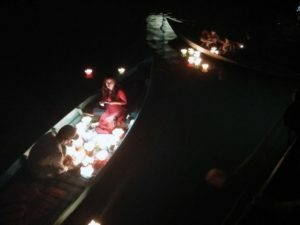 The peacefulness of the floating lanterns in the river was juxtaposed by the fast flow of tourists on the bridge, taking their selfie and then moving along. The water was also full of tourists on traditional boats, each of them laughing as they had to quickly duck down and lay perfectly flat in order to fit under the bridge. Their guides never quite giving them enough notice to do it gracefully, but just enough notice that they didn’t hurt themselves. Delicious and healthy — what more could you ask for? Vietnam even makes deep fried foods feel good for you, always accompanied by fresh leafy vegetables and herbs and a light dipping sauce. Nothing disappointed, regardless of budget. We enjoyed lots of street side soups ($3-4 per bowl) and banh mi (baguettes with egg, pork, or chicken and fresh vegetables, $2-5 per sandwich), mid-range restaurants ($3-7 per main course, usually spending about $10-20 for our family of two adult and one child eater) and even enjoyed a fine dining experience after winning the door prize at an expat event. Set course meal of deliciousness, make sure you sit in the garden rather than in the restaurant on the street where they put all the tourists to show how popular it is. Delicious chicken satay, mixed vegetables, and Vietnamese pancake served with rice paper, dipping sauce and leafy veg and herbs to make a wrap. Owned and run by a lovely Japanese man we especially loved the okonomiyaki (Japanese pancake). Tatami mat seat if you have baby / young children, and they have fun children’s cups for drinks and onigiri (rice triangle stuffed with tuna) which should satisfy picky eaters like ours. Australian cafe, restaurant and deli, with an outdoor playground including trampoline, and an indoor playroom. Try the zucchini balls and five dips. Excellent and original cocktails, especially the sangria. Try to get the tatami mat seat by the window if you have a baby / young children. Brand new (opened March 2017) co-working space with cafe. Beautiful space and beautiful community of people. 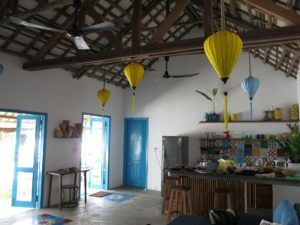 Located in Tra Que Village between Hoi An and An Bang Beach. Everything we tried here was delicious, try to sit at the tables right next to the garden and see the farmers at work. You can spend the whole day and into the night at Soul Kitchen. Sit on the beach, or look over the beach from your own hut. Live music most evenings. Wide lounge seating excellent for young kids to roll around behind you while you enjoy the delicious food. We ate here many times, as did most people in An Bang Beach. Everything was delicious, and they have baby seats. What a gem! Excellent coffee and sublime atmosphere, you can sit in the tea rooms, garden or beach area. Try their coconut latte — its a fresh coconut blended with a shot of espresso and served with the coconut’s water on the side. There’s a lot to see around Hoi An. Da Nang is the big city nearby and well worth a visit, as well as My Son ruins. There’s also Marble Mountain (though we were told it felt a bit tacky touristy) and lots of bicycle tours in the rice paddies (though we also enjoyed just exploring on our own). 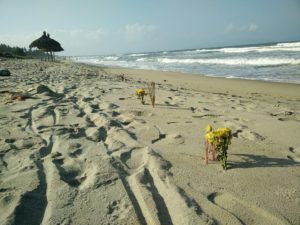 What are your favourites highlights of Hoi An and An Bang Beach?